I found a lovely oasis south of Myrtle Beach, South Carolina: Brookgreen Sculpture Gardens, the oldest and largest attraction of its kind in the United States. Philanthropist Archer Huntington and his wife, Anna, a sculptor, turned the former Brookgreen Plantation into a showcase for art and native plants and wildlife. Opened to the public in 1931, the plantation is on the National Register of Historic Places. A visit here is like stepping back into another era. You could spend hours just following the garden walkways. For campers, adjacent Huntington State Park offers tent and RV camping (105 sites with partial hookups and 24 with full hookups – 1-843-237-4440). 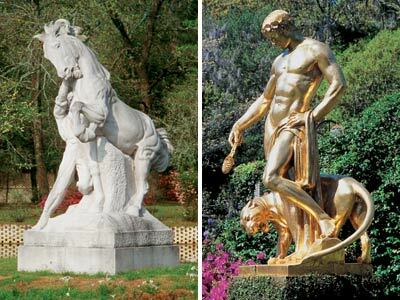 Brookgreen Gardens is on U.S. Highway 17 between Murrells Inlet and Pawleys Island, roughly 20 miles south of Myrtle Beach. It's open daily from 9:30 a.m. to 5 p.m. Admission is $12 for adults age 19 and older and $10 for students ages 13-18.